At our house, traditions are the rule of every holiday. Actually, traditions are just plain the rule. You have to be careful of doing something once, because the kids might deem it a tradition, and you better darn well do it again the next year, exactly the same or you'll have some outraged children on your hands! I love how traditions are like that, though. They really keep our families connected to one another, especially as our children grow older. It seems like the majority of our holiday traditions are in conjunction with the big holidays: Christmas, Easter, and even Valentine's Day. What about some of the holidays where we actually celebrate each other? Our parents do so much for us throughout our entire lives. I'm 40 years old and my parents are at my house right now helping me out with things we wouldn't be able to do without them. And it isn't just home projects, they help me figure out how to discipline my children (they have many more years of experience than I do), they help me make difficult decisions (they are full of great advice), and they help me get through the overwhelming feelings I so often experience as a busy wife and mother. But most of all, they love me. And they always have. I am so grateful for my parents and we do have a few traditions that celebrate them each year on Mother's Day and Father's Day. My parents--my mom especially--mostly just love to receive letters on these holidays. My mom wants to hear how much we love her and why. She saves every single letter and I assume she reads them often. Phone calls are a big tradition, too. With my parents living a couple thousand miles away, we can't have a nice dinner together and so we have to rely on the telephone (or Skype or Facetime). Even though I talk to my parents often, it's important that I recognize them on the holiday that was created to honor them. And it's my pleasure to do so. However, as I think about the traditions my family has for other holidays, I feel like these calls and letters--wonderful as they are--aren't enough. I think about how much we look forward to watching certain movies on specific days during the Christmas holidays. I think about how excited we get about eating foods that we only get on Thanksgiving Day or at Easter dinner. How about creating some traditions we can really get excited about? 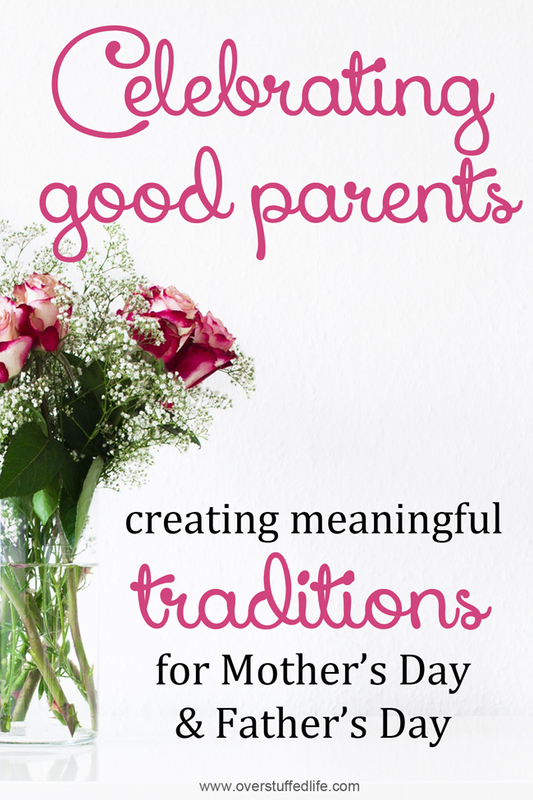 Traditions that will be meaningful to parents, but also something kids will have fun doing, and that will teach them thoughtfulness in the process. 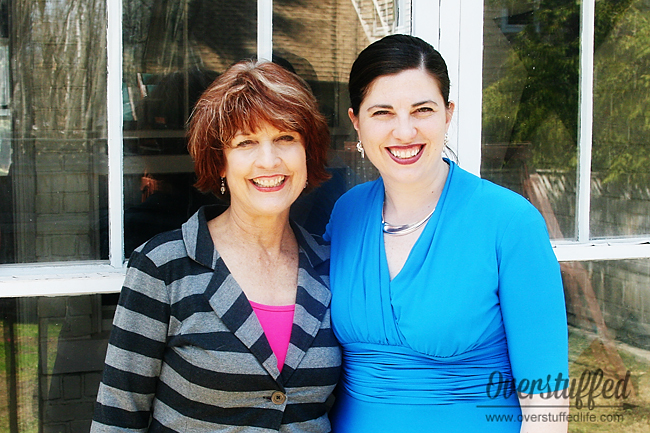 What are the things your parents or spouse absolutely love? What would make them happiest on their special day? Remember that this day is all about them--celebrate what makes them unique and go from there. Is your mom a film buff? Take her to the movie she wants to see most every Mother's Day. Does your dad love to spend time on the golf course? Take him golfing every Father's Day, and if you can't do that, gift him with a free game instead. Some of our favorite traditions are our silliest ones. Make Dad "king for a day" and give him a special crown he is required to wear all day. Give a book-loving mom a book she can read out loud to her children. Compose a song to sing to your dad every Father's Day that's all about him and how he has influenced your life. Go on a special walk or hike together--to the same place every year. So remember how I said my mom loves receiving letters? I think this year we'll make a video letter for her instead. She will love having her grandchildren talk about how much they love her, and of course The Maestro and I will do the same. Think of the things you already do and make them a little bit bigger and a little bit better. This doesn't have to cost extra--it just takes extra thoughtfulness. My sister-in-law brings a doughnut to every mother in her life--friends, sisters, daughters, cousins--on the Saturday before Mother's Day. She makes sure to honor all of them with a hug and a treat. I always intend to do something similar, but never actually do it. Maybe this year will be the year. Because it makes me feel wonderful to have people other than my own husband and children recognizing my efforts as a mother. This is something your children can do, too. They can honor teachers, coaches, or other influential adults in their lives on Mother's Day and Father's Day. The trick to all of these tips is to make it special. Choose things that you will only do on this one day of the year, then it will truly be something you can look forward to all year long! Let’s celebrate our parents with New York Life by sharing how we plan to honor our parents this Mother's and Father's Days. Share a photo on Twitter or Instagram using the hashtag #KeepGoodGoing and then visit New York Life's Celebrating Good page to see how others are celebrating their moms and dads. What are your favorite Mother's Day/Father's Day traditions? Mother's Day brunch is a fun tradition. I like to take my mother out for lunch. We usually do it the day before Mother's Day when it isn't as crowded! Love going golf with my dad for Father's Day. My favorite Mother's Day tradition is to make my Mom breakfast and give her a gift and take her out to dinner and spend the day with her! Now my son and daughter carry on the tradition by making me breakfast and giving me a heartfelt gift and going out to dinner, but the most important thing about Mother's Day is spending time with your kids, and Mom! I like to make my husband a special meal to let him know that we love and appreciate him. I enjoy having lunch with my parents and spending the day together. The whole month of June is really rough, my sons birthday, my husbands birthday, fathers day and our anniversary, so this would be awesome to win! We usually do a grill for my husband and the boys give him presents he is not too keen on sweets so we make him some homemade granola or trail mix or something healthy. Then we all tell him reasons why we love and adore and appreciate him! My favorite Mother's Day/Father's Day tradition is having big family barbecues for each day. We always get together for a nice cookout. My favorite Mother's Day/Father's Day tradition is to enjoy dinner together. Dinner or a BBQ is our yearly tradition. We always go out to a lovely brunch on Mother's Day. A great way to treat my mom! Favorite Mother's day tradition is to have a nice meal together and give mom lots of presents and balloons. I don't have a tradition but I always make sure to take the time to do something special for my Mom and dad and let them know I'm thinking of them and that I appreciate them. Our families favorite Mother's & Father's Day traditions is having a brunch, or getting together to have a banquet. I agree with you 100% and what a sweet picture of you two! Family traditions keep everyone together and growing each year. Each year we get our entire family together and either do a big brunch or cookout at the lake. It is always such a special day and we create so many memories that we will cherish forever! I try to have low expectations on mother's day because I've been let down far too many times! Though one of the best things we do as an extended family is to get together and let the guys plan and cook the meal. It's nice to have a night off from that.! I wish I had better traditions! It doesn't seem to be as important to my husband as it is to me.... but in his defense, he comes from a family that isn't big on celebrations, unlike MY family that makes a big deal out of everything! My mom always made every holiday a big deal. Funny how these things pass on generation to generation. My favorite tradition is taking my Mom out to eat and then buying her favorite flowers! We like to have a BBQ and invite our parents over for a great meal. Then we usually take a walk around the neighborhood together. I love taking my mom out to breakfast! ROBLOX is driven by a growing player base of more than 300,000 creator players who provide an infinite variety of highly immersive experiences. These experiences range from 3D multi-player games and contests, to interactive adventures where friends can take on new avatars to imagine what it feels to be a dinosaur, a miner in a quarry or an astronaut out in space.